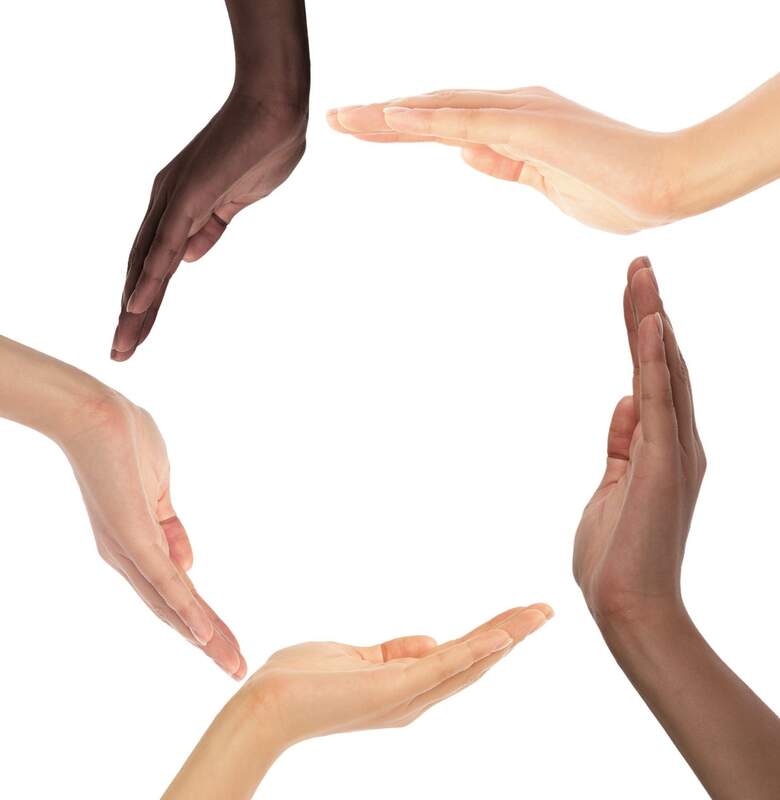 One aspect connected to the whole story of Vitamin D that is of interest to me is that of the color of my skin. As my skin type is central to how diligent I should be with sun protection, the amount of melanin in my skin seems to add to my protection capabilities, right? This in turn leads me onto asking how much sun is good for me, how much 'tanning' is good for me, and ultimately how much sun do I need to create good levels of Vitamin D in my system? So with these questions in mind, I read this article on The Evolution of Skin Color from The Vitamin D Council with great interest. Jablonski argues that the last theory above has the most merit, although I thought they were all pretty great actually! Folate deficiency interferes with normal development and causes birth defects, thus creating the survival needed for adequate folate levels. While folate really comes from our diet, exposure to the sun's UVA rays harms the levels of folate's main serum blood form - 5-methylhydrofolate. Darker pigmentation, or higher melanin levels in our skin, enables us to absorb and scatter the sun's UVA rays, resulting in a decrease in folate destruction. Under the relatively higher UVR conditions experienced in Africa, Australia and South America a darker skin evolved to maintain folate sufficiency. Knowing UVB rays are the ones that create Vit D through our skin, I deduced that I need to exert quality management of my exposure to the sun's UV rays. ie. I need to obtain maximum UVB for Vit D creation, without getting sunburnt but allowing my melanin levels to increase (get a tan! ), and thus limit the exposure to the damaging UVA rays. These theories attracted me to another article about dark pigmentation in animals. 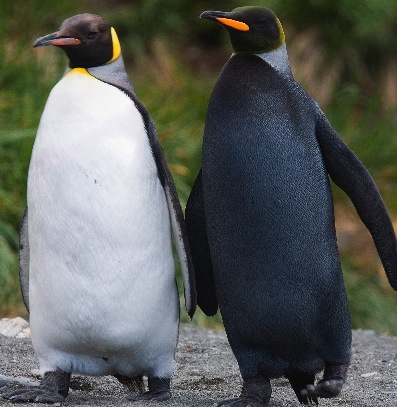 Apart from wondering if they are also affected by varying Vit D levels, these melanistic creatures, as opposites to albinos, mean they're much darker in color than normal. One of the best known melanistic animal example is the Black Panther, which is actually a leopard that has changed their spots into one BIG spot. Another example is Americas' largest big cat - the Jaguar. As a melanistic specimen they are relatively well known to both ancient and modern society. 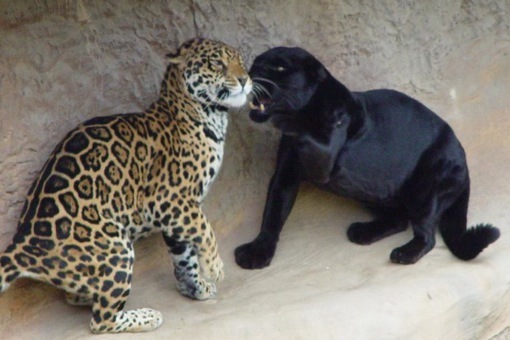 Black Jaguars are comparatively easy to propagate in captivity because the gene for melanism is dominant, as opposed to the gene for melanistic leopards (black panthers) which is recessive. Moving on to other more rare sightings I had to ask myself, what evolutionary advantages may there be for an all-black penguin out there in their snow-white world? Perhaps being a little warmer than the others? Providing the sun shies that is. Make them easier to spot in the crowds I guess, but after watching March of the Penguins, it doesn't really seem to be an issue? Servals in Africa are more commonly found to be melanistic when living at high altitudes. Perhaps the evolutionary advantage here relates to heat conservation and camouflage rather than any relation to Vitamin D? Another African animal displaying some melanistic qualities is the Zebra. 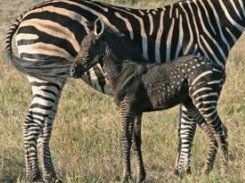 Depending on the strength of the melanistic gene and how it acts on certain individuals, we see the results more in the increased width of their black stripes, rather than their whole bodies being completely black. At the other end of the pigment scale is albinism, where zebras are lacking in black pigment and we see this in pale or missing stripes. 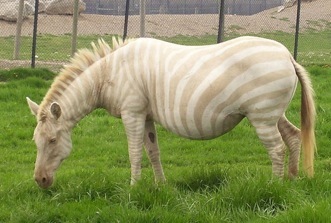 Often referred to as 'blonde zebras'. From the evolutionary angle, think about how tough life on the African plains is at the best of times, where blending in with the herd is a matter of life and death. Standing out against the background doesn't really allow for an uplifted survival strategy surely? At the end of all this, I decided to personally continue to promote quality sun exposure for increased melanin production, great Vitamin D creation and NO sunburn!